This reflection by Aimée Mitchell is in response to the Analogue Film Gathering that took place 23-24 March 2016 in Calgary, AB. This past March, I joined representatives from across the Canadian media arts sector who gathered in Calgary to discuss the ways in which the media arts sector can continue to support the production, exhibition, and preservation of analogue film. It was a chance for those engaged within this network to voice concerns and strategize a focused way forward together with the Independent Media Arts Alliance (IMAA). Staff and board members from production and distribution centres, alongside folks from film collectives and our last standing film labs in Canada were present. For two days we addressed the specific needs of analogue film from on-the-ground perspectives, and brainstormed ways forward in regards to sharing and accessing resources, approaching funding bodies for preservation support, and addressing the need for equity and outreach within the sector both for staff and the communities they serve. The gathering coincided with the Calgary Society of Independent Filmmakers (CSIF) $100 Film Festival, which happened to be celebrating its 25th anniversary. The festival is one of the few in Canada that solely showcases the work of small-gauge film on film – a poignant and complimentary event that put into practice some of the concerns raised during our daytime sessions. So after a day of thoughtful discussion, we found ourselves immersed in film and critically engaging with the very medium we spent the day unpacking. Those in the media arts sector understand better than anyone the immense labour that lives within a finished film print running through a projector. But there was something about the proximity of our discussions and engaging with film each night that amplified the network of labour for me. Mostly, it allowed me to consider the ways in which the sector operates as an ecosystem with internal and external forces impeding on its ability to thrive. 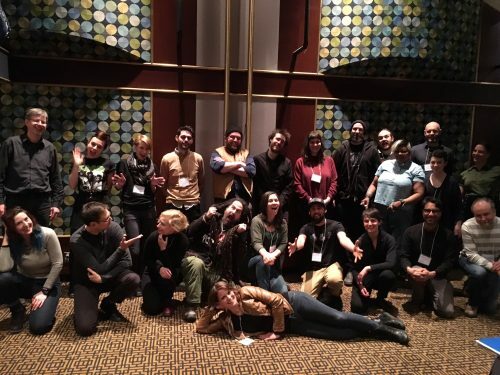 What follows here is a recap of the questions, concerns, and suggestions that emerged from the two-day gathering – through the lens of safeguarding analogue film practices and preservation within the media arts sector. This look back at our discussions reveals the gaps and lacks – where we need to learn from failures in order to move away from systems perpetuating inequity and consider whose voices are being safeguarded. Knowledge sharing and apprenticeship: how does the sector hold on to knowledge about the repair and care for legacy media? How can the sector move away from reifying film technology, and the idea of it being an exclusionary medium in order to make it accessible to everyone? How can production centres address the rural/city divide in terms of resource access? Scarcity of hardware, repair, and supplies. Meaningful outreach to marginalized communities where the labour of outreach is not placed on the partnering organization. Provide the media arts network with an active database of who has which specialized film equipment and where it is located. A digital database of equipment manuals that people can continually add to. A list of individuals who can do major repairs (i.e. the travelling Steenbeck repair person). An actively updated parts sourcing database for equipment and gear. Partnering with engineering schools for tooling and 3D part prototyping. Production centres bulk buying supplies within a region, or perhaps the sector (i.e. approaching Kodak for a bulk purchase of film stock). If a partnership could be made, perhaps they would also donate additional stock for outreach programs. Create a database of labs in North America and what kind of processing they specialize in to share with filmmakers. Partnering with schools and community organizations to teach the basics of analogue film in their learning environment rather than at a production centre. Managing the expectations of filmmakers regarding the fidelity of the original film image versus a new print, and the quality of image of a digital scan. The precarity of the state of labs, though business is often steady. Work with distributors and production centres to educate analogue filmmakers about the fidelity of analogue and digital transfers. Work with distributors and production centres to educate analogue filmmakers about the value of digital scans, especially as a point of reference for the lab. High-resolution film scans are welcomed by archives and labs. It is a safe way to access the work without having to expose original elements to possible damage or environmental changes. How can distributors work with production centres and programmers to promote the work of artists of colour and folks from marginalized communities? How can the notion of a distributor’s film canon be revised, reconsidered, done away with? Who does the notion of a canon serve? How do distributors support the circulation of film on film when a print is delicate? How do you not scare off a programmer from showing fragile or one of a kind prints, knowing that they would be liable for damage? Not enough filmmakers of colour, Indigenous, and Two Spirit folks are being distributed and programmed, especially when they are emerging artists and need the encouragement in order to pursue their art practice. Distribution centres have become de facto archives, but have no funding to support the safeguarding work they inevitably do by caring for a print collection. How to keep a fragile film collection active, yet consider the fidelity of the works and the intentions of the artists. Bring the National Indigenous Media Arts Coalition (NIMAC) into the conversation and listen to what the organizations and artists they represent need and would like support on. Create more forums for artists to voice their needs with their distributors beyond an annual general meeting. Develop a dedicated film vault for filmmakers to deposit elements, or partner with one of Canada’s larger archives to begin the discussion of independent artist deposit. Create a standardized film print inspection form for internal use at distribution centres to accurately track print conditions. These reports could be shared with filmmakers. Work with filmmakers to discuss their film preservation plan, legacy, and safeguarding their original elements. Work with IMAA and production centres to secure artist rates at film labs for striking new prints. Work with labs to educate filmmakers about the benefits of digitizing their work, and help to manage the expectations of the fidelity of the digital scan. How does a filmmaker or distributor make the call as to what exhibitor is to be trusted with a rare print? How can distributors and artists educate programmers in the importance of showing film on film when it is possible? Who should pay for the costs of a new print when damage is done? When is a new print required? What level of damage? Programmers, when given the option, will often choose digital over a print to keep down shipping and projection costs. There are fewer and fewer venues with 16mm and 35mm pedestal projectors. There are fewer projectionists who can confidently project and troubleshoot pedestal projectors. There are fewer people able to properly service projectors. There are fewer sources for projector parts (for those organizations who are not already hoarding a variety of projector models). There is no projection/exhibition guideline standard to follow for smaller micro cinemas outside of cinematheques. Micro cinemas and collectives do not always have the means to pay for replacement prints when a film is damaged, leaving the collective, filmmaker, and distributor left trying to sort out a solution. Compile and actively update a database of exhibition spaces that have film projection available, including the projector models, bulb wattage, gauges, and film speeds. Make available a database of digitized projector manuals. Bring trained projectionists to different regions of the country to knowledge share and give workshops on the basics of film projection, maintenance, and repair. Create a standard film information sheet that distributors and independent filmmakers can modify and fill out to send along to exhibitors/projectionists. This would also include basic projection tips, and an area for the projectionist to fill out if there was damage or issues with the screening. Partner with engineering schools for tooling and 3D part prototyping of projector parts (especially rollers and archival gates). Since the Analogue Film Gathering, movement has been made on a few fronts in terms of advocacy and organizing. A group of attendees at the gathering have continued the conversation on how the sector can move forward on the issues raised this past March. Discussions have been focussing on how a larger national or international gathering could take place within the next few years. While ideas are still in the brainstorming stages, the momentum created by the Analogue Film Gathering is still resonating with participants and calling them to action. In addition, many of the distribution centres and media arts organisations have also been invited to participate in a SSHRC Partnership Grant spearheaded by Professor Janine Marchessault at York University. I had the opportunity to work on this grant application as an administrator, and once again was inspired by the immense amount of enthusiasm within the media arts sector to come together and share expertise in safeguarding the ecology of the network. Archive-Counter Archive: Activating Canada’s Moving Image Heritage (A/CA) is a 6-year research-creation partnership that seeks to address the crisis facing Canadian audiovisual heritage through a systematic, multi-institutional plan for facilitating public access and public policy. A/CA seeks to activate Canada’s most precarious audiovisual heritage by studying and engaging with a selection of case studies at Canada’s artist-run centres including the Canadian Filmmakers Distribution Centre, Groupe Intervention Vidéo, Urban Shaman, VIVO, Vtape, and the Winnipeg Film Group. These case studies will encompass media arts made by women, Indigenous peoples, the lesbian, gay, bisexual, transsexual, two-spirited and queer (LGBT2Q) communities, and archives from Canada’s immigrant communities. 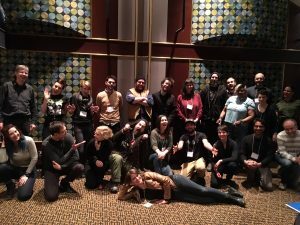 The project hopes to foster an audiovisual archive network in Canada, linking community archives to citizens, researchers and policymakers to identify the needs of audiovisual preservation across different community contexts, and illuminate the challenges and epistemologies that surround 21st century archives. The success of this grant would strengthen the audiovisual preservation advocacy that IMAA and the sector continues to move forward on. The much anticipated outcome of this project proposal is expected in late March 2018. Returning to the metaphor of the ecosystem to discuss safeguarding analogue film in all its capacities: the 21st century is deeply invested in models of sustainability that involve everyone doing their part to save, reserve, or protect resources. If we think about analogue film as an ecosystem that needs to be revived as a cultural resource, then there needs to be strategies and resources implemented and shared to sustain the system in a way that serves all parties involved. The Analogue Film Gathering enabled the sector to gather an overview in order to move into action. Activating the media arts network requires both professional and unrecognized skill sets to work together – those within our formal media art spheres, but also those who continue to be left out. These conversations are integral moving forward. Agency must be felt within the network of the ecosystem in order to keep the environment active, vibrant, and growing. Lastly, my perspective and position within this ecosystem at the time of the Analogue Film Gathering was from the standpoint of a film distributor and collections manager at the Canadian Filmmakers Distribution Centre (CFMDC). I have since left my post at CFMDC, but continue to find myself connected to the community in my other capacities as a projectionist, programmer, academic, and media arts advocate. I have cared about the living and active legacy of unique film prints from these views: as someone who works with artists to safeguard their work while also keeping it in circulation, as the person trusted to inspect, thread, and project artisanal prints, as a programmer who respects the artistic choices of a filmmaker wanting to screen their film on film, and also as a scholar interested in the history, politics, and day-to-day practices of audiovisual preservation in Canada. From these various perspectives I have reflected on the March gathering, and the network that supports the artists who continue to experiment with analogue film. I look forward to witnessing and participating in future gatherings to build on the momentum that this event ignited. Aimée Mitchell is the former Distribution and Collections Manager at the Canadian Filmmakers Distribution Centre. She is currently the Project Manager for the XL-Outer Worlds Project, which is commissioning five Canadian artists to create short large-scale films inspired by the invention and technology of IMAX. She is a MITACS Post-Doctoral Fellow at York University, where she is researching the early history of IMAX, and the reconstruction of this history through traces from personal fonds and counter archives. She holds a PhD from the York and Ryerson University Joint Communication and Culture Program. Her dissertation explored the politics and practices of audiovisual archives in Canada, and more specifically, the importance of DIY archiving practices in its various forms. She was an archival researcher and contributor to the book Reimagining Cinema: Film at Expo 67 (MQUP 2014). She is a collective member of the Toronto Queer Film Festival, which showcases contemporary, innovative, queer and trans film and video art, and also a board member of the8fest small gauge film festival. She is an advocate for media artists of all gauges and mediums.